If you are nursing mother then fasting on Karva Chauth is surely a matter of concern. If it is your first Karwa Chauth as a new mom then it is not easy having a day without water or food because you have to breastfeed your baby and the health of your newborn depends on your diet and health. And in case your baby is under six months then mother’s feed is his only diet and fasting can adversely affect the supply of milk. Therefore, just like Karva Chauth fast during pregnancy is an important decision, fasting as a lactating mother is also an important concern. Similarly, you can also learn about Breastfeeding and Navratri Fasting For New Mother. Experts share that Karwa Chauth during pregnancy or after pregnancy is a very subjective decision. It depends upon your body and its strength. Staying hungry for a couple of hours is not such a serious thing but staying without food and water for a day can definitely reduce the supply of milk. Make your Karwa Chauth 2018 a comfortable one even if you are a nursing mother with some very helpful Karwa Chauth fasting tips for breastfeeding mothers. 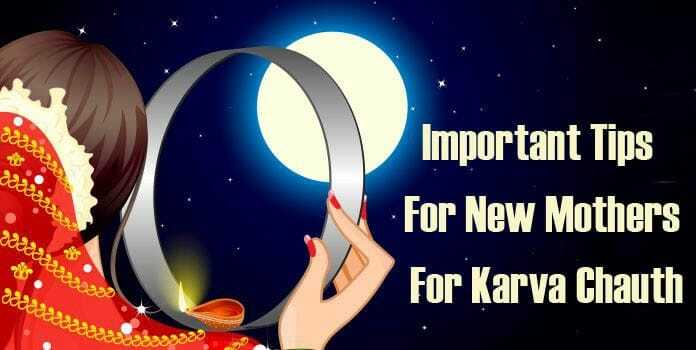 Follow these Karva Chauth fasting tips to enjoy this special day without any worries. It is extremely important for you to save your energy because the prime focus for you for now is your baby and his feed. So take nap, rest as much as you can so that your body is able to conserve whatever amount of energy possible. Sargi being the first meal of the day gives you all the liberty to have a healthy and nutritious meal. It is very important that you plan this meal and include things that help you feeling fuller for longer. Go with goods that are rich in proteins and keep you hydrated for longer. Avoid taking food that are rich in oil because then you will find yourself thirsty. Because you are nursing mother, therefore, it is not possible for you to stay without food and water all day long, so making some changes in your fasting regime are good for you. Allow yourself to have fruits, milk and water once or twice in a day to stay hydrated. Discuss with your doctor if you can give your baby top feed. Because this will keep your baby full on stomach and will also help you stay hydrated. But if your baby is very small then there is no option to give him top feed. Healthy Almond Milk for Baby is a good recipe to give your baby. It is very important to reach out to your doctor immediately whenever you feel unwell. Don’t delay and call your doctor just when you start to feel uneasy. These are some of the tips for new mothers to keep in mind in Karva Chauth fasting which can help them have a smooth day.